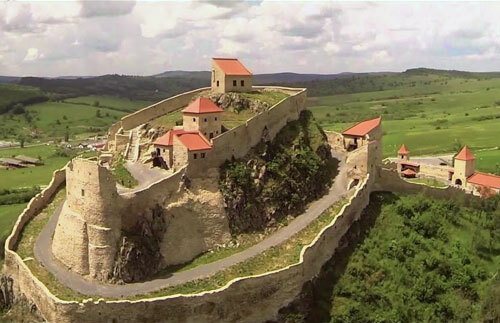 Rupea Fortress, located on the Northwestern side of Brasov county, was built on a basalt rock. The first trace of the citadel is on a document where the writers referred to it as Koholom citadel meaning the rock eminence. It is said that on that particular rock once existed a Roman camp, during the time Dacia was conquered by Romans. Later on, the Saxons and Hungarians who settled on these lands rebuilt the camp. The first attestation dates back from the year 1324 when some refugees found a hidden place in the citadel running from the fury of the Hungarian king Robert Carol's army. Little by little the inhabitants built three protective towers and two interior courtyards. Inside the fortress there is a well 40m deep where the water is still drinkable. In 1790, a strong storm destroyed the roof and since then it hasn't been repaired. 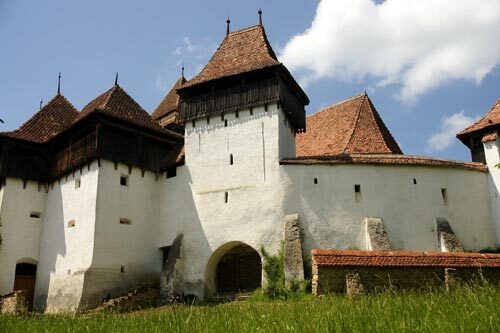 Viscri Fortified Church is best known for its highly fortified church, originally built around 1100 AD. 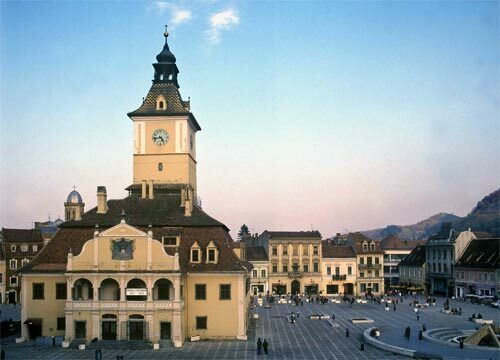 The first documentation of Viscri is a record of church taxes dated around 1400, in which the village is referred to as being part of the Rupea parish. It's inhabitants consisted of 51 farmers, 1 school master, 3 shepherds and 2 paupers. Viscri is part of the villages with fortified churches in Transylvania, designated in 1993 as a World Heritage Site by UNESCO. 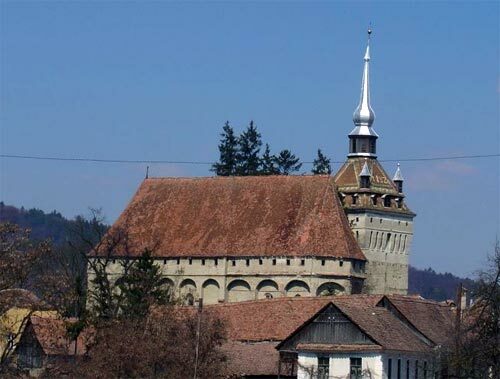 Around 1185 the church was taken over by Saxon colonists, and the Szecklers were forced to settle in southeast Transylvania. In the 14th century the eastern part of the church was rebuilt and in 1525, the first fortifications with towers were added. In the 18th century the church was surrounded by a second defense wall. After 1743 a covered corridor for the storage of corn was built. A century later, two chambers in the defense corridor of the bastion were turned into school rooms. The classic 19th century altar has as centerpiece "the Blessing of the Children" by the painter J. Paukratz from Rupea. The font was made from a capital of the 13th century church. To this day, the church is surrounded by a cemetery with gravestones dating back to the Bjielo-Brdo culture. Saschiz Fortified Church is very impressive due to its huge proportions and the way that the fortifying elements have been adapted. But all the defensive elements are surpassed by the beauty of its gothic architecture: huge arches, massive buttress and decorations. The Church holds one of the most beautiful chalices made by the goldsmiths in Transylvania. The chalice of the Evangelical Church at Saschiz is richly adorned, with its leg decorated with beams, an inscription and a trimming with lily flowers. The settlement is known for its folk pottery (of a zgraphitocobalt type) since 1702, as well as for its folk costumes and fabrics. Saschiz has been first mentioned in writing in 1305. In 1419 it counted several guilds, of which those set up by shoemakers, carpenters and house painters. By that time, Saschiz boasted several schools, a hospital, Turkish bath-house and a court-house. 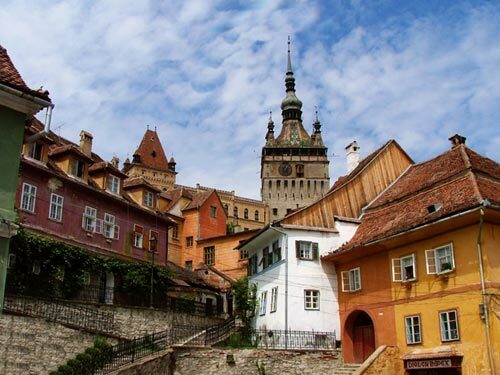 Founded by Transylvanian Saxons during the 12th century, Sighisoara still stands as one of the most beautiful and best-preserved medieval towns in Europe. Designated as a World Heritage Site by UNESCO, this perfectly intact 16th century gem with nine towers, cobbled streets, burgher houses and ornate churches rivals the historic streets of Old Prague or Vienna for atmospheric magic. It is also the birthplace of Vlad Dracula, also known as Vlad Tepes (Vlad the Impaler), ruler of the province of Walachia from 1456 to 1462. It was he who inspired Bram Stoker's fictional creation, Count Dracula. Sighisoara's main point of attraction is the Clock Tower, also known as the Council Tower, built in the second half of the 14th century and expanded in the 16th century. The four small corner turrets on top of the tower symbolized the judicial autonomy of the Town Council, which could apply, if necessary, the death penalty.